This weekend Mark and I started readying the house for our big floor face lift. The flooring guys arrived bright and early Saturday morning with our new red oak for the kitchen. They wanted to drop it off a week early so that the wood would have time to acclimate to our house before installation. 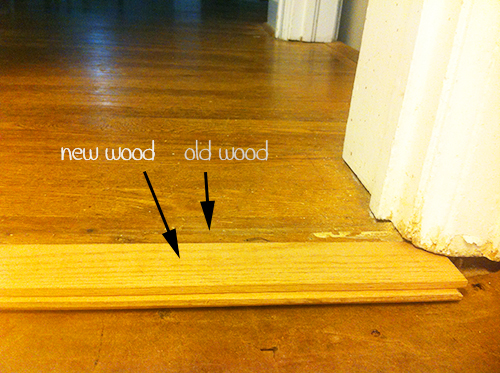 This cuts down on the amount of swelling/shrinkage you’ll experience after the wood is installed and makes for a better floor. 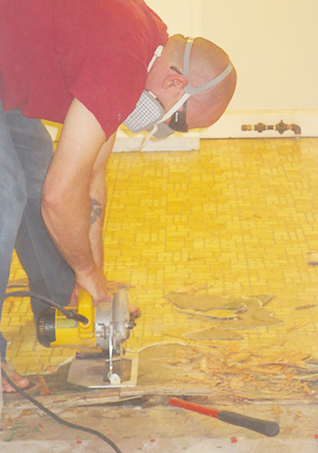 Once they left, we got to work on pulling up the existing kitchen floor which looked like this when we started. 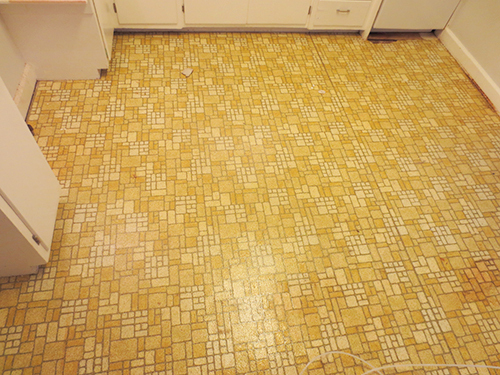 This layer of vinyl tile flooring came right up with almost no issues, exposing this lovely yellow layer. It was when we started to take up this layer that things started to get interesting. It appears that this yellow layer was glued right to the original layer of vinyl sheet which was red and green. (Christmas year round! I know.) Unfortunately, I don’t have a good picture of the original tile as the yellow layer was stuck so well it wouldn’t come off as a separate layer. As we were trying to pry the two layers of vinyl up, we realized that they were glued to a layer of 5/8″ plywood. Not only was this a surprise, but we also quickly realized that this plywood was original and ran under the kitchen cabinets. Ruh roh. We needed a way to cut the plywood out from around the bottom of the cabinets. I smell a new tool. 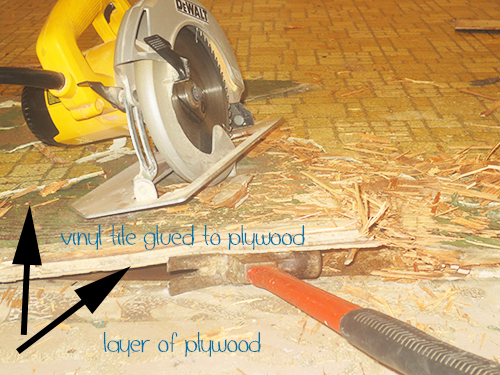 Instead of trying to pry up the vinyl layers from the plywood, we used a circular saw (pictured above) to cut just through the vinyl and plywood so that we could remove it in chunks. 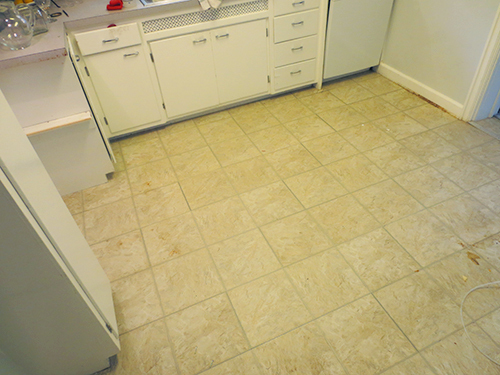 We were able to get most of the floor up that way, but obviously we ran into trouble as we got near the cabinets. Since you can’t use a circular saw in tight spaces, we headed off to Home Depot to pick up a cordless multi-tool. This tool is built precisely for what we needed. 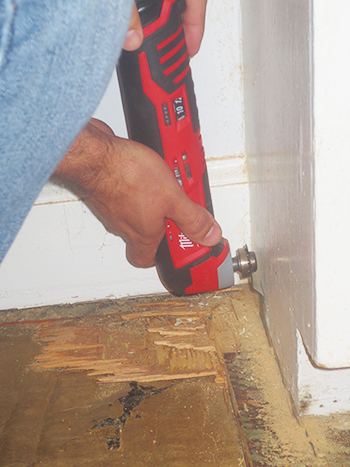 The little blade quivers back and forth ever so slightly so that you can cut down into the floor without harming the cabinet around it. Mark has actually been wanting this tool for awhile and he was very impressed with the job that it did. 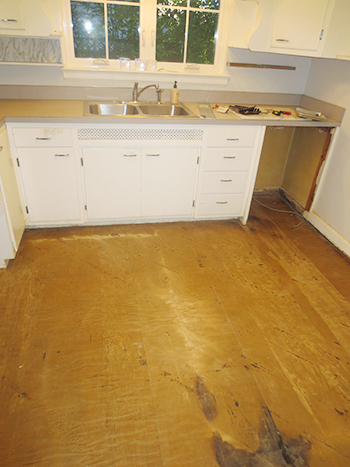 Once he had cut around the cabinets and deep enough into the floor, he used a crow bar to release and remove each panel of flooring. This was a pretty big job. On Saturday we were able to remove the top layer of vinyl and the two layers attached to the plywood from everywhere except near the cabinets. That took about four hours. Then on Sunday, it took another six hours to remove the area around the cabinets. Much of this was downtime while the battery for the tool re-charged since we were cheap and only bought one. The tool itself was $80.00, the battery was $50.00, and the battery charger was $60.00 so it wasn’t an inexpensive purchase, but we really didn’t have another choice. Once all the plywood was removed, we were left with this. What you’re seeing in the photo above is 65 year old construction felt paper. 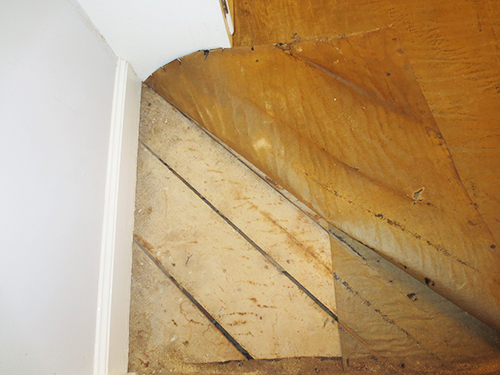 What that paper is covering is wood planks of varying widths from 3″ to 8″ running diagonally over the floor joists. See the space in between each of these planks? That’s a clear view to the basement below. Hi basement! Apparently in 1948, standard building procedure was to install your flooring choice right over top of these paper covered diagonal planks. 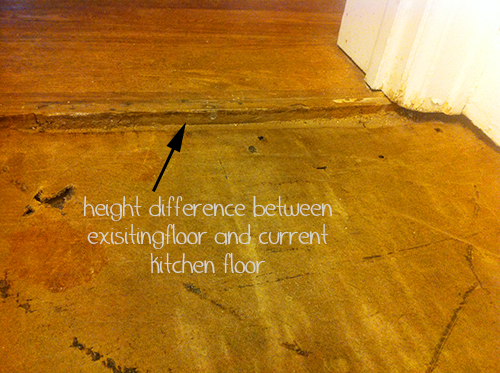 I know this because not only was the vinyl kitchen floor this way, but the hardwood floor as well. Once we got the layer of plywood up, the floor in the kitchen was exactly the level it needs to be to install the new hardwoods. As you can see in the photo below when you put a piece of the new wood on top of the current floor it is the same height as the old floor. If we were to install a modern sub floor over the existing diagonal planks, the floor in the kitchen would be igher than the existing hardwoods. And that’s not what we want. So we’re going to replace the old construction felt paper with new and pray that the flooring people will not blink at the lack of sub floor and be cool with installing our new wood floor right over what’s there now. If not, we will have to install the new floor ourselves next weekend. They don’t make them like they used to I tell ya. In this instance I don’t know it that’s a good thing or a bad thing. I guess we will have to wait and see. Mark is going to nail down the diagonal planks where there are currently squeaks in the floor and hopefully it will feel just as solid under foot as the rest of the house. And hopefully the visual of being able to see into the basement from the kitchen above will fade away over time. So that’s how our weekend went. This week we’re moving more stuff in preparation for the floors as well. With the kitchen out of commission, I am off cooks duty for a little while. I actually miss it! My hat’s off to you and Mark! I remember taking off the wallpaper in the little den of my first house. Huge steamer, scrappers and lots of elbow grease. Much to our surprise, we found out that there were FIVE layers of wallpaper awaiting us! My favorite one was the black wallpaper with green-ish colored peacocks (this is true!). Guess it went with the green shag carpeting we ripped out. It is really satisfying when it’s all re-done, but it sure is hard work! Love hearing about your projects! Can I just say that I love that Mark is wearing flip flops while using a circular saw.